Imagine devices that capture electricity from the air ― much like solar cells capture sunlight ― and using them to light a house or recharge an electric car. Imagine using similar panels on the rooftops of buildings to prevent lightning before it forms. Strange as it may sound, scientists already are in the early stages of developing such devices, according to a report presented at the 240th National Meeting of the American Chemical Society (ACS). "Our research could pave the way for turning electricity from the atmosphere into an alternative energy source for the future," said study leader Fernando Galembeck, Ph.D. His research may help explain a 200-year-old scientific riddle about how electricity is produced and discharged in the atmosphere. "Just as solar energy could free some households from paying electric bills, this promising new energy source could have a similar effect," he maintained. "If we know how electricity builds up and spreads in the atmosphere, we can also prevent death and damage caused by lightning strikes," Galembeck said, noting that lightning causes thousands of deaths and injuries worldwide and millions of dollars in property damage. The notion of harnessing the power of electricity formed naturally has tantalized scientists for centuries. They noticed that sparks of static electricity formed as steam escaped from boilers. Workers who touched the steam even got painful electrical shocks. Famed inventor Nikola Tesla, for example, was among those who dreamed of capturing and using electricity from the air. It's the electricity formed, for instance, when water vapor collects on microscopic particles of dust and other material in the air. But until now, scientists lacked adequate knowledge about the processes involved in formation and release of electricity from water in the atmosphere, Galembeck said. He is with the University of Campinas in Campinas, SP, Brazil. Scientists once believed that water droplets in the atmosphere were electrically neutral, and remained so even after coming into contact with the electrical charges on dust particles and droplets of other liquids. But new evidence suggested that water in the atmosphere really does pick up an electrical charge. Galembeck and colleagues confirmed that idea, using laboratory experiments that simulated water's contact with dust particles in the air. They used tiny particles of silica and aluminum phosphate, both common airborne substances, showing that silica became more negatively charged in the presence of high humidity and aluminum phosphate became more positively charged. High humidity means high levels of water vapor in the air ― the vapor that condenses and becomes visible as "fog" on windows of air-conditioned cars and buildings on steamy summer days. "This was clear evidence that water in the atmosphere can accumulate electrical charges and transfer them to other materials it comes into contact with," Galembeck explained. "We are calling this 'hygroelectricity,' meaning 'humidity electricity'." In the future, he added, it may be possible to develop collectors, similar to the solar cells that collect the sunlight to produce electricity, to capture hygroelectricity and route it to homes and businesses. Just as solar cells work best in sunny areas of the world, hygroelectrical panels would work more efficiently in areas with high humidity, such as the northeastern and southeastern United States and the humid tropics. 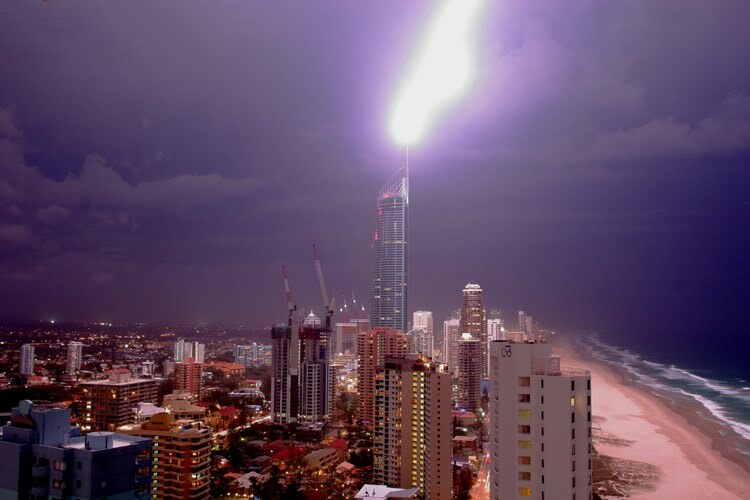 Galembeck said that a similar approach might help prevent lightning from forming and striking. He envisioned placing hygroelectrical panels on top of buildings in regions that experience frequent thunderstorms. The panels would drain electricity out of the air, and prevent the building of electrical charge that is released in lightning. His research group already is testing metals to identify those with the greatest potential for use in capturing atmospheric electricity and preventing lightning strikes. "These are fascinating ideas that new studies by ourselves and by other scientific teams suggest are now possible," Galembeck said. "We certainly have a long way to go. But the benefits in the long range of harnessing hygroelectricity could be substantial." CNPq (National Council for Scientific and Technological Development) and FAPESP (The State of São Paulo Research Foundation) funded the study.